Mid-term evaluation is here and I wanted to give some feedback to the community on what was accomplished as far as the regular user can see on stkaddons (the name of the website should be changed to something more meaningful ;) ). I finished with my exams just a couple of days ago, so from now on I can work full time :D.
Enough with the chit-chat let’s get into the actual work. On the first glance on the new interface you can see that the website is much wider and some of the user and addon pages look quite different (aka they look kinda ugly, this is only a temporary measure for now as the website transitions to the new modern look). 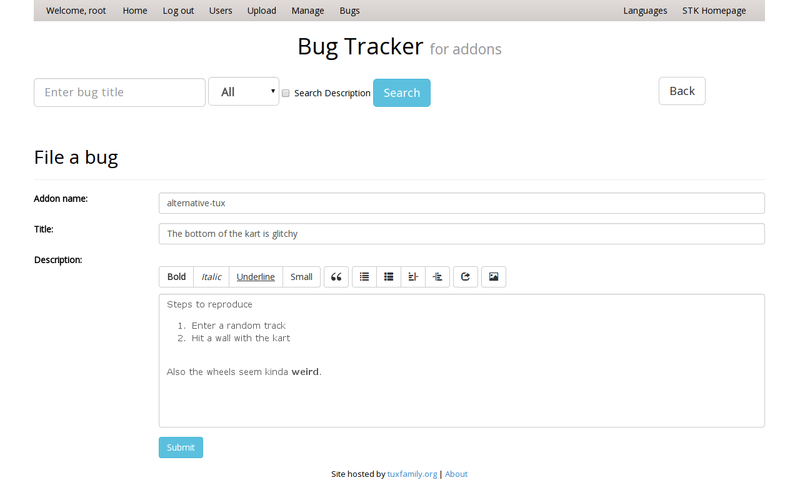 You can get a feel of how the whole website will look in the new bug tracker for addons. 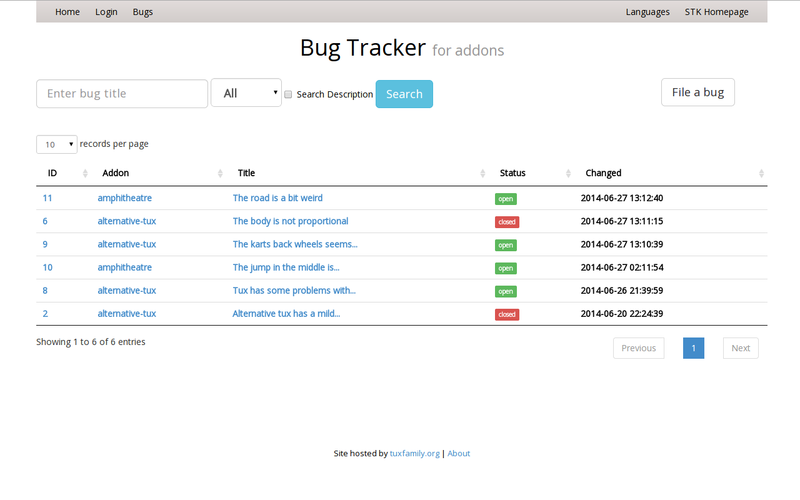 This is a bug tracker built from the ground up just for the addons of STK where users can report if they have some problems with the some of the addons. 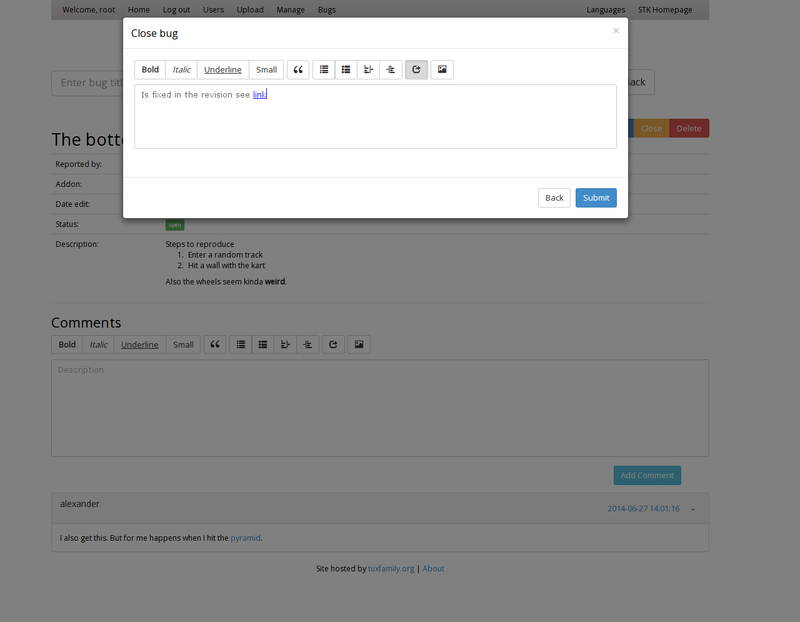 There is also the ability to sort (click on a column header or footer to sort in a direction) or to search by different criteria (by close status, search in title, search in description). 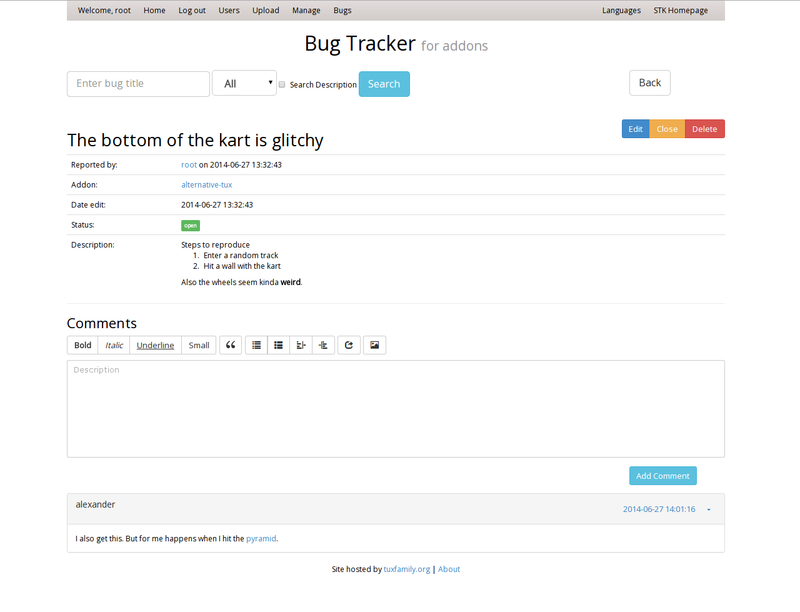 The view of a bug is quite different depending if you are logged in, you are the bug owner, you have edit privileges, etc. The user that is not logged in. 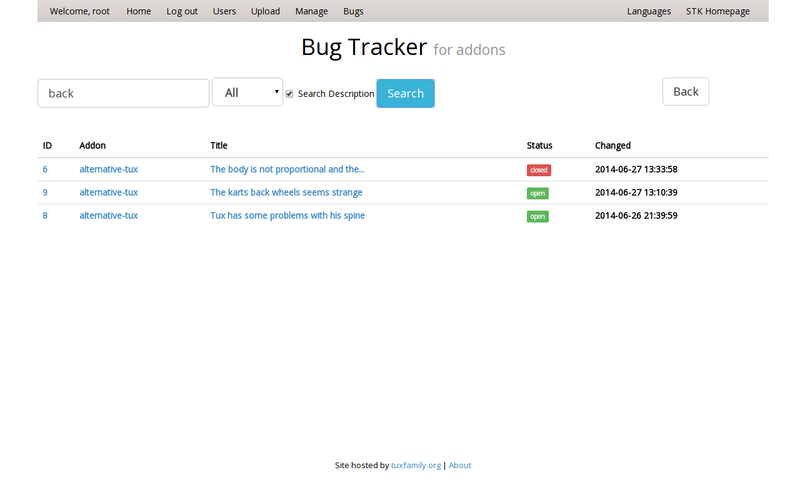 The user is logged in and has full privileges (besides being the bug owner). 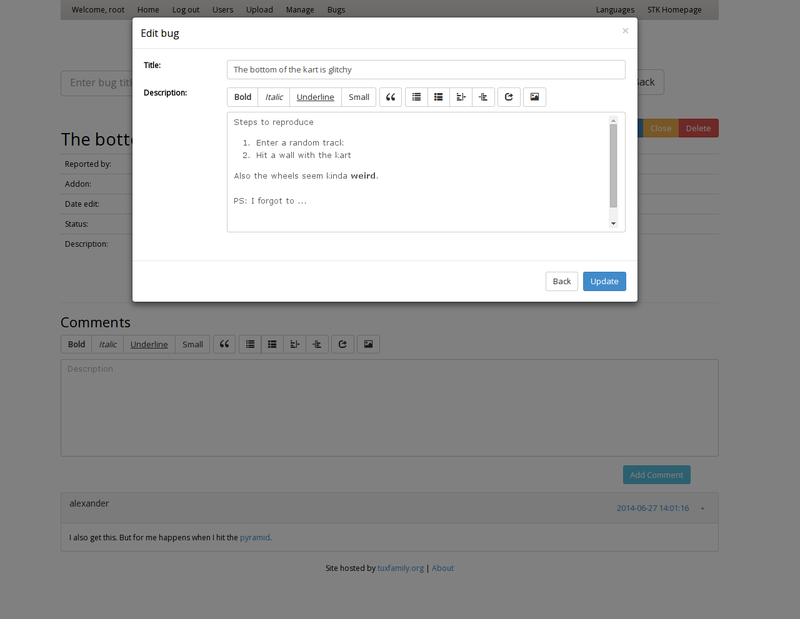 The bug owner (or moderators/administrator) can edit or close the bug. Other work besides the bug tracker has been put in restructuring the code and changing how a lot of things are done (hopefully making it easier for other developers to join in the future) and to add a new role system alongside new management options (but I will not be showing those here because only a handful of people will ever see this when the website is live). If you have any question or just want to bash me, just leave a comment or contact me in the IRC channel at #stk (can find me as leyyin). 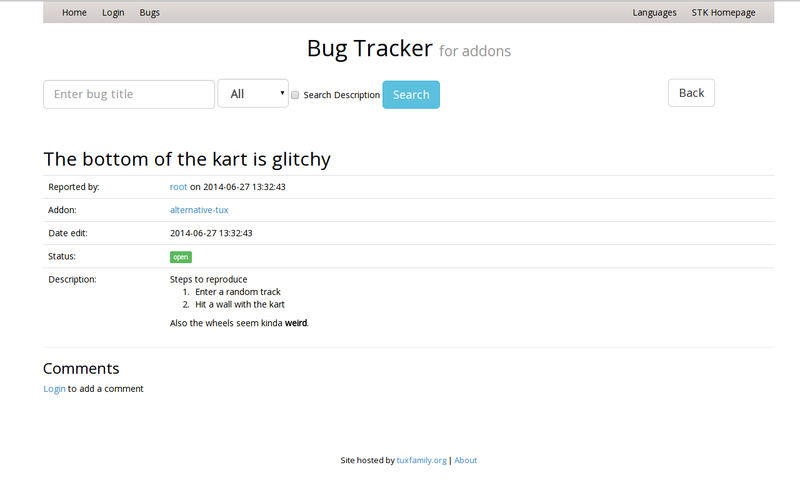 The code is available at https://github.com/leyyin/stkaddons. STK rules! I'm really happy to see how this project keeps growing and growing! Also perhaps you could use the bugs and feature-requests tied to releases in the future and some of them as just in future.